Writing in the Sunday Times (of London) today, Thatcherite professor and Mitt Romney backer Niall Ferguson has claimed that the populism of Republican presidential candidate Donald Trump needs to be “stamped” on. 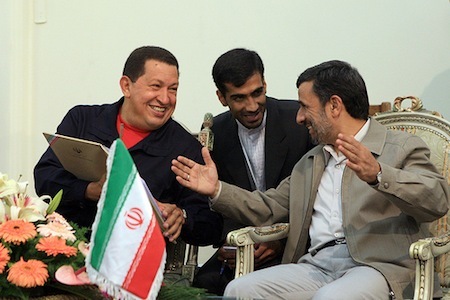 Hugo Chavez and Mahmoud Ahmadinejad meeting in 2010. Credit: Flickr/chavezcandanga.Originally posted on Informed Comment. Francisco Toro is a Venezuelan journalist, political scientist and blogger. Born and raised in Caracas, he attended High School and College in the United States.Hugo Chávez died today in Venezuela at the age of 58, but his battle with a never-specified form of cancer was waged largely in a Cuban hospital—a telling detail, as Cuba loomed just as large in his political imagination as his native country.It's a point that my gringo friends up north always struggle with. The Cuban Revolution's immense influence on the region has been constantly underestimated and misunderstood from day one. It's only a slight exaggeration to suggest that everything of note that's happened south of the Rio Grande since 1959 has been an attempt either to emulate, prevent, or transcend the Cuban experience. Chávez will be remembered as the most successful of Fidel Castro's emulators, the man who breathed new life into the old revolutionary dream. Greg Grandin teaches history at New York University and is a member of the American Academy of Arts and Sciences. His most recent book, Fordlandia, was a finalist for the Pulitzer Prize in history.I first met Hugo Chávez in New York City in September 2006, just after his infamous appearance on the floor of the UN General Assembly, where he called George W. Bush the devil. “Yesterday, the devil came here,” he said, “Right here. Right here. And it smells of sulfur still today, this table that I am now standing in front of.” He then made the sign of the cross, kissed his hand, winked at his audience and looked to the sky. It was vintage Chávez, an outrageous remark leavened with just the right touch of detail (the lingering sulfur!) to make it something more than bombast, cutting through soporific nostrums of diplomatese and drawing fire away from Iran, which was in the cross hairs at that meeting.The press of course went into high dudgeon, and not just for the obvious reason that it’s one thing for opponents in the Middle East to call the United States the Great Satan and another thing for the president of a Latin American country to personally single out its president as Beelzebub, on U.S. soil no less. This weekend, Oliver Stone’s new documentary, South of the Border, his ode to Hugo Chavez and South and Latin America’s new quasi-Marxist and not so quasi dictators, has opened in New York City and Los Angeles, and will open nationwide in a week. It had a showing this past Wednesday at the AFI Silverdocs Festival in the Washington, D.C., area, and my article about it appears today in the weekend edition of the Wall Street Journal. I argue therein: “What Mr. Stone and his writers have presented is a standard far-left narrative that is part of a long line of propaganda films, a modern American version of the old agitprop. There are no dissenting voices in this film. Nor is there any mention of the fact that Mr. Chávez has closed down television and radio stations that disagree with him and arrested dissenting political figures.” The film is what you can expect from the likes of Oliver Stone, a virtual know-nothing who uses his celebrity and acclaim as a film director to spew out hatred for the country that has made him wealthy and influential. Oliver Stone is the director of some of Hollywood’s most famous films, from “Platoon” to “Wall Street” to “JFK.” Last week he sat down in the Los Angeles offices of his production company, IXTLAN, to talk with Global Viewpoint Network editor Nathan Gardels about his recent documentary, “South of the Border,” and his upcoming release, “Wall Street: Money Never Sleeps.”"South of the Border"Nathan Gardels: As you show in your recent documentary, “South of the Border,” US diplomacy and the American media have reacted with general hostility to the empowerment of the poor and indigenous in Venezuela, Bolivia, Ecuador, Paraguay and, to some extent, in Brazil. Why is that?Oliver Stone: I suppose it comes from the old imperial impulse of the US toward Latin America going back to the Monroe Doctrine, Teddy Roosevelt, the protection of American business interests, and support for military dictators throughout the cold war. The US remains hostile to anyone on the left coming to power in their “backyard,” anyone who thinks the resources of a country belong to its people. How has Cuba changed since Fidel Castro handed over power to his brother Raul? And how are U.S.-Cuban relations today? As the U.S.-imposed Cuban embargo turns 50 this year—established the year after Castro came to power in 1959—many Americans wonder if United States foreign policy is still served by the embargo. Historian Daniel Masterson considers the arguments on both sides of the debate, and the Obama administration’s inertia in effecting change. An expert in Latin American civil-military relations, revolution and counterinsurgency, race relations and immigration, Professor Masterson also examines current affairs in South America as well as potential security concerns. Masterson began teaching at the United States Naval Academy, the second oldest of the country’s five service academies, in 1979. He has seen firsthand the academic training of thousands of young men and women who have gone on to provide key leadership roles as naval and marine corps officers and commanders in America’s military establishment. Located in Annapolis, Maryland on a windy stretch of land abutting the Chesapeake Bay, the Academy has influenced military policy and pioneered war technologies in a wide range of global and regional conflicts since its founding in 1845. Jeffrey W. Rubin is associate professor of history at Boston University, where he directs the Enduring Reform Project, a research initiative focusing on business responses to progressive reform. He received a MacArthur Foundation Research and Writing Grant for his research on social movements and democracy in Latin America.March 31 is the birthday of the Chavez Americans love to love ... Cesar Chavez led the United Farm Workers (UFW) to successfully take on California agribusiness in the 1960s, and his soft-spoken manner and fierce commitment to social justice inspired a generation of activists.Supporters remember the grape and lettuce boycotts of the 1960s and '70s as a time when ordinary people joining together began to change the world. 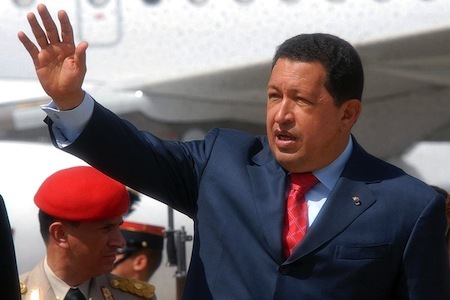 Mr. Chavez' birthday is celebrated in eight US states, and during the 2008 campaign US President Obama said he'd make it a national holiday, in tribute to the charismatic Latino icon.Hugo Chavez is the Chavez Americans love to hate. Blustery President, challenger of US influence in Latin America, and subverter of democratic norms, Mr. Chavez seeks counsel from Fidel Castro and mocks US presidents in public. He polarizes Venezuela by alternately rallying the poor and shutting down radio stations, and he urges leftist presidents across the Americas to take up his anti-US and anti-capitalist stance. 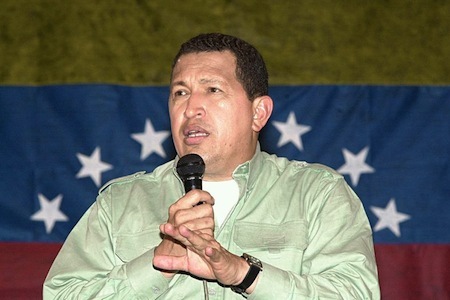 Hugo Chavez has made a career of being rejected by authorities who then underestimated his ability to take sweet revenge. Chavez was rejected by his family, the military, the political elites of Venezuela and finally U.S. President George W. Bush, but survived to punish every one of them. Here is the sad story of the making of a bully boy.Chavez experienced the bitterness of rejection early in life. Born in a dirt-poor village to a large family, his childish wild behavior was handled by locking him in a dark closet for days on end. His parents gave him to his grandmother to bring up -- he calls her Mama to this day. As a teenager he would cross the street to avoid even eye contact with his real mother.While both his parents were teachers, at school Hugo was a dismal failure. He failed science in high school; he failed the test for university entrance; he faked his way into the military academy as a baseball player; and he finished last in his military class, blaming it on his teachers.